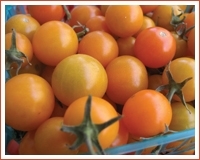 Home > Three Cheers for Cherry Tomatoes! While Happy Boy's cherry tomatoes are always delicious - and they are typically harvested through the Fall - something about the first few weeks of the season are absolutely magical. They are like the first true gems of summer, brightly colored, filled with flavor, and hinting at the bounty in store - and they also make for some prime market snacking. 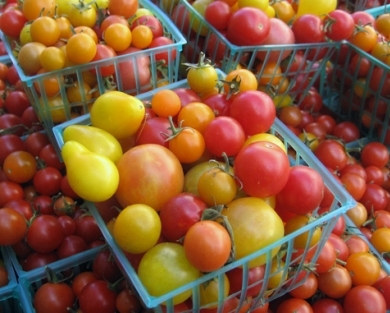 Three Cheers for Cherry Tomatoes! We are just starting to see the first of our famous heirloom tomatoes trickle in from the fields. Come mid-July, these tomatoes will be taking center stage at market as their timed plantings yield weeks of perfectly ripe fruit begging to be sliced, diced, sauced and otherwise devoured. 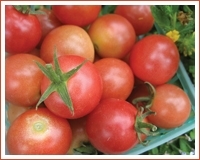 But right now, our cherry tomatoes are enjoying their spot in the limelight with a plethora of varieties and a surprising range of different flavors and cooking options. 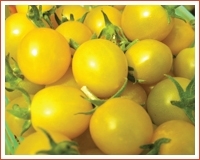 First heavily cultivated in Italy, Greece and Spain, cherry tomatoes are a completely different seed and type of tomato plant from our other tomato varieties. 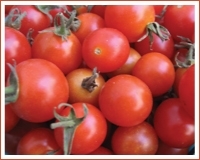 They aren't "baby" tomatoes, rather a type of tomato that has been grown over hundreds of years to produce small fruits jam-packed with intense sweet, tart or smoky flavors. 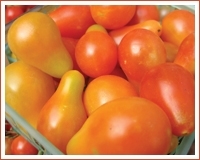 They also contain less water than a regular sized tomato - which translates into more tomato-goodness pound for pound. When most people think cherry tomatoes they think SALAD! And for good reason - these small fruits are a perfect way to easily introduce bright color and tomato, without a lot of slicing or dicing, to some HB salad greens. For those looking for recipe options other than salads or stand alone snacks, they can also be quickly sliced in half and used to top a simple pasta. 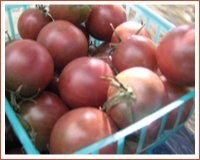 Or, add a few into a Cherokee purple heirloom tomato salsa or a traditional tomato bruschetta for a splash of color contrast and tomato variety. Many cherry tomatoes are also surprisingly great for a quick sauce - just toss a basketful onto a roasting pan with a sliced spring onion, coat with olive oil and a dash of balsamic vinegar, and put under the broiler. In under 10 minutes, you will have browned tomatoes in a light yet sweet and tangy sauce that doesn't need to be cooked down. This sauce makes some pretty irresistible pasta toppings and can also be used to dress grilled steaks and fish. And speaking of fish - for any adventurous seafood lovers out there - ahi tuna ceviche with avocado and limes is taken to tantalizing new heights with the additions of some sliced HB sungolds and cilantro.